In February, 2016 I was afforded the opportunity to visit Projecto Titi in Colombia. 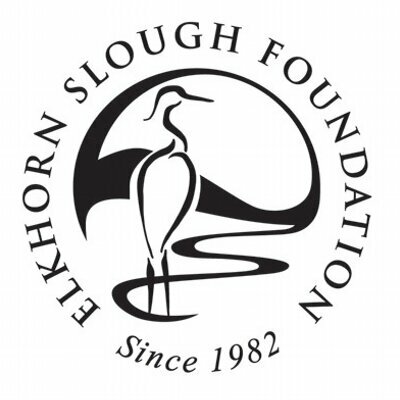 This came about through my involvement with the Wildlife Conservation Network whom I have been a volunteer with for several years. 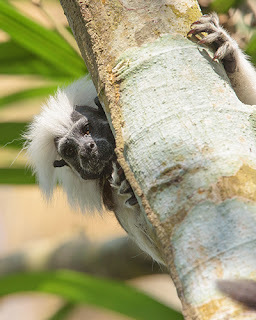 Myself and three fellow volunteers were incredibly excited to not only visit this beautiful part of the world, but to have the chance to actually see the critically endangered cotton-top tamarin in the wild! The tiny cotton-top tamarin weighs less than a pound and is name appropriately named for the shock of white hair on the top of its head. The monkeys, nicknamed the cutest in South America, entertain researchers with their endless antics which we would ultimately see for ourselves. We took a red-eye flight out of San Francisco on Copa Airlines, connecting in Panama and arrived in Cartagena the following afternoon. Projecto Titi had arranged three jam packed days for us covering a wide range of activities so we could see and experience the full scope of their operation. The plan for our first morning was a trip to El Ceibal, Santa Catalina to meet with Rosamira Guillen, Executive Director of Projecto Titi and her team whom would take us out into the forest to potentially see the cotton-top tamarins in their native habitat. We were picked up at 6:30am joining WCN's VP of Conservation, Jefe Parrish and his daughter who were also joining our group. 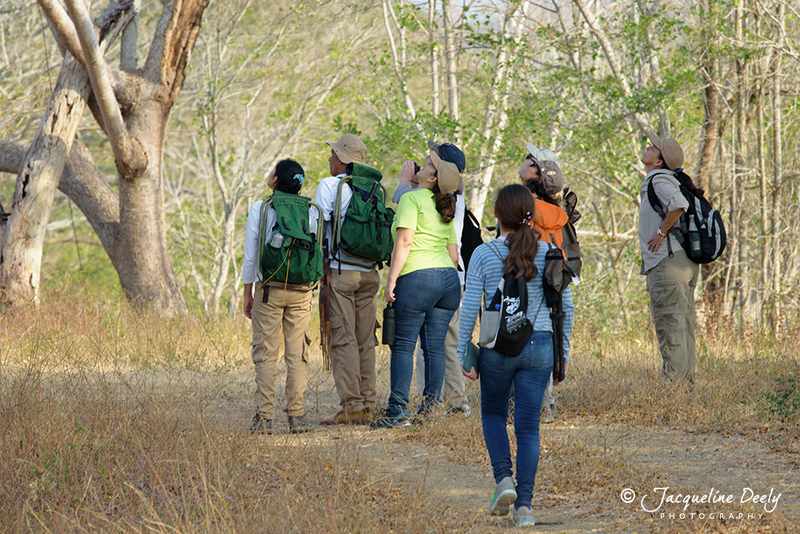 El Ceibal is one of the protected study sites where field research is being conducted by Projecto Titi. Because of their small size, cotton-top tamarins are very difficult to locate and and follow in the wild. However, Projecto Titi has developed a unique technique where animals are captured once a year, anesthetized and marked on various body parts with a bright color using hair dye. 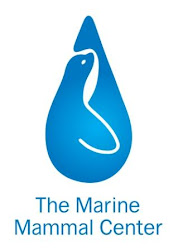 This allows for identification through dense vegetation and lasts for up to 6 months of exposure. The dominant male in each group is also fitted with a radio transmitter in a backpack harness in order to locate the animals with telemetry. 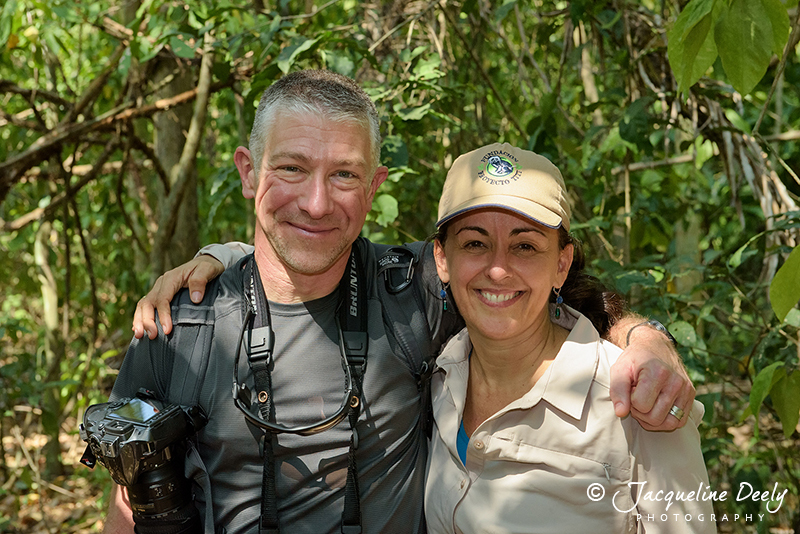 Although still relatively early in the day, the heat and humidity was intense as we set out into the forest and we stopped en route to view various birds including beautiful scarlet macaws. The landscape was very dry as Colombia is experiencing one of the worst droughts in its history. As we made our way in deeper, a receiver was used to help locate the tamarins. It did not take long however with the experience of our Projecti Titi guide to locate them and we were soon met with several curious onlookers. I cannot describe the feeling of seeing an animal that is so endangered in its natural habitat in the only place on the planet where it can be found. We were all in absolute awe to say the least. Having only seen them in pictures could not convey just how small they were and how incredibly cute! 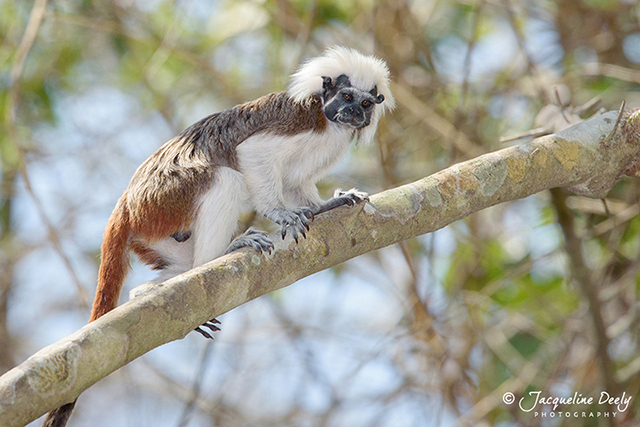 Cotton-top tamarins are among the most endangered primates in the world and only found in northwestern Colombia. The species was declared endangered in 1973 following the exportation of 20,000 - 40,000 tamarins to the United States for use in biomedical research. I find it very hard to comprehend how a creature so beautiful and so limited in its range could have been plucked from its home and subjected to such horrors. Thankfully this is no longer the case, but now the tamarin faces other challenges to its survival and once again at our hands. The greatest threat today is deforestation for agriculture, fuel, and housing in addition to collection for the local pet trade in Colombia. Many Colombians who live near the cotton-top's forest home do not know that these monkeys - known locally as "titis" - are endangered. 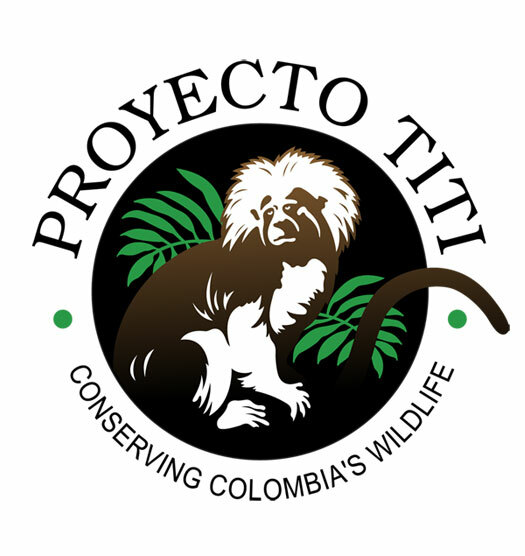 Projecto Titi aims to change this by providing information about the cotton-top alongside employment opportunities that enable locals to protect the forest and its monkeys. On our way out of the forest, we encountered other animals way up high in the canopy including a howler monkey with her baby and a sloth hanging upside down sleeping. Upon my return home, I did a search for sloths in Colombia and learned that they are one of most highly trafficked animals in the illegal pet trade, many of which end up in the USA as pets. Many do not survive outside the rainforest, because of their complicated diet of about 40 different plant species.